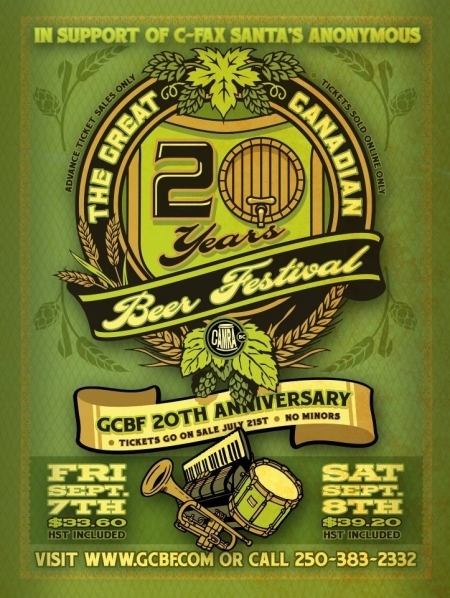 VICTORIA, BC – The 20th annual edition of the Great Canadian Beer Festival (GCBF) is taking place at Royal Athletic Park in Victoria, BC on September 7th and 8th, 2012, but those intending to be there will need to plan ahead to make that happen. Tickets for both days of the Festival will be going on sale tomorrow – Saturday July 21st – at 9:00 AM Pacific via the GCBF website, and if past years are any indication, it won’t take long for them to sell out. In addition to celebrating the two decade landmark, this year’s instalment will see a stronger focus on Canadian beer than past years due to a change in legislation that makes it more difficult for organizers to host American breweries. As noted in a Monday Magazine article published last month, more than 80% of the stalls this year are expected to feature Canadian craft beer – up from 55% last year – with breweries from BC, Quebec, Ontario, Alberta, Manitoba, Saskatchewan and the Yukon all confirmed to attend. I love Canadian beer, especially IPA’s from victora, but I think it’s a shame they charge so much for this beer festival ($40? ), give such small tasters, and limit it to so few tickets. They sold out right away before I even knew the tickets were on sale (congrats to fans who got tickets though, well-deserved). The Portland fest, on this weekend, charges nothing for admission, offers much bigger and lower cost samples, and can be attended by far more beer fans. We should learn from that festival’s openness and lack of greed by its organizers.